Popular with Tourists and Expat Residents, the Sugar Shack makes a great meeting point right in the middle of town. Just off Beach Road in the Centre of Pattaya. All the major sports events are shown on our TVs. Call in for a cold beer and watch all your favourite games: English, Scottish, Italian, German, Spanish and French Football plus Champions League, Golf, Rugby, F1, Cricket, Tennis, Boxing, MotoGP, Snooker, V8 Supercars, Cycling, Darts, UK and Australian Horse Racing, EPL, SPFL, NRL, AFL, NHL, NFL, MLB, MLS, NBA, UFC…. If there are no live games on we have the Jukebox to entertain you with a large selection of music to satisfy most tastes. Of course there is also the Pool table so you can play a game of Pool with your friends or challenge the staff to a game. If you feel a bit hungry you can order from our menu, we have delicious European food, Thai food and Pizza available. Golf trips are organised during the week to many of the great golf courses less than an hours drive by air conditioned minibus. We also have storage lockers for your golf clubs and clubs for rent. 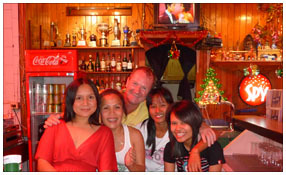 We are also a member of the Pattaya Quiz League and compete on Mondays and Wednesdays. Call into the bar to find where we will be playing this week. All are welcome to join our team to test their knowledge. the city to relax on the golden beach, play some volleyball, have some tasty food and enjoy a beer in the clear waters.